Those of you following my blogs will be pleased that I finally perfected and finished my embroidered card to send to my sister. 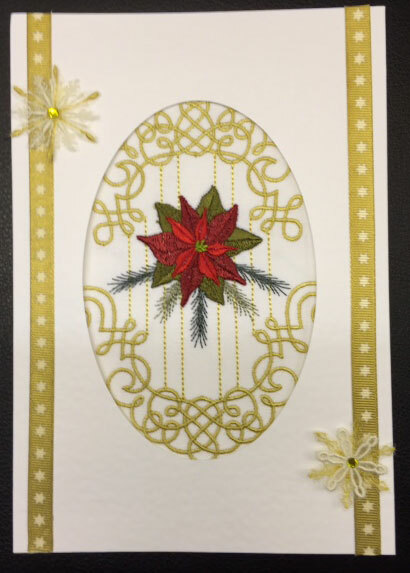 I was not happy with the snowflakes that I had made at all, and it was only when I was testing out a design for Poinsettia Promises 2 I noticed that one was just the right shape for my large oval insert cards. I trimmed around the design, slipped it in the card and it looked perfect! But what about the snowflakes? I was determined to use them so I looked for ribbons to stick with doubled sided tape each side. I looked at the possibility of two types of ribbon but settled for one, marking the alignment with a pencil mark. Then I determined to reduce the size of several snowflakes by about 30% as after experimentation I had realised that it was easier to trim around smaller designs than larger ones. The two snowflakes I used come from Graceful Snowflakes 2013. 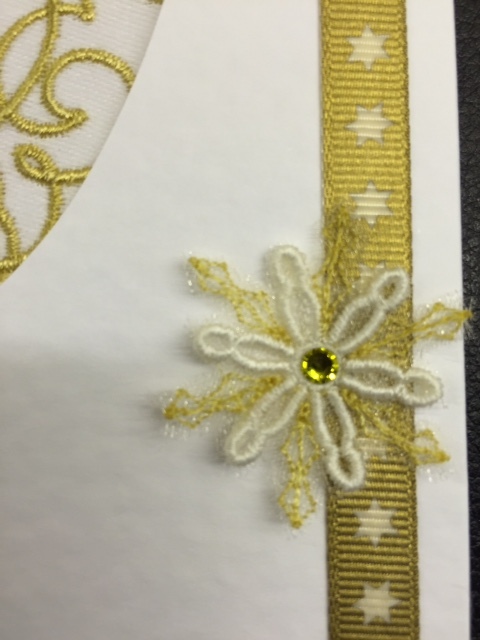 I used the gold from the main design and an off white for my snowflakes stitching them on a pale gold organza using one layer of Floranni Wet ‘N Gone. Before washing these little snowflakes I trimmed the backs of all loose threads and jump stitches but I left the actual outline trimming until they were dry. 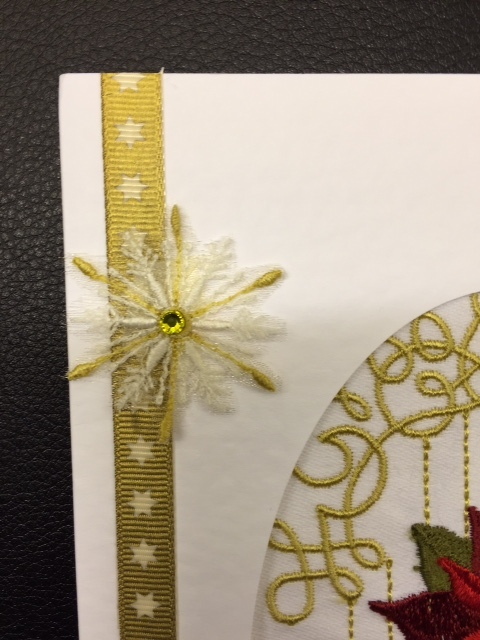 I stuck each finished snowflake on the gold ribbon and added a hot fix crystal in the centre. Although I had intended to add more snowflakes and perhaps a few extra crystals I decided this was enough. Here is the finished card and I must say I got an immediate response of delight when my sister received it in the post. After Christmas I will be gifting the small snowflakes that I adapted for this card to all those who are following this blog. Now I have created the perfect sized snowflakes I can see lots of uses for them, on the tree, on napkin rings and attached to gift labels on presents. It is a shame it is too late to use them in this way this Christmas. However there is always next year and there will be another set of Graceful Snowflakes too! 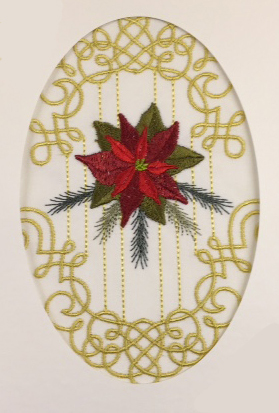 This entry was posted in Embroidery projects and tagged Making embroidered cards, Snowflakes. Bookmark the permalink. Thank you! I hope it inspires lots of you to create embroidered cards. Apparently all the cards I have created for my sister come out each Christmas. It turned out just beautiful! Such a beautiful card to receive. Your card is gorgeous! I don’t think you can design anything less than gorgeous. Merry Christmas, Hazel! Sew talented. Love the card, it is beautiful. I made embroidered Christmas cards this year and learned sew much. Your card is simply elegant. I think next year I will make an ornament to place inside, that can be removed after Christmas to use next year. What a wonderful idea. Not that gets me thinking! You may want to make some suggestions. Happy New Year. May 2015 be full of embroidery challenges & successes!